In a ceremony attended by a group of Palestinians and Internationals, under the initiative of the Holy Land Christian Ecumenical Foundation (HCEF), as part of Bethlehem Heart of Christmas, Bethlehem Museum celebrated the lighting of its Christmas tree which was decorated with gas bombs and live bullets fired by the Israeli occupation army on Palestinian citizens. The tree was decorated with dozens of teargas canisters and stun grenades which were painted with Christmas decorations, while the child of the cave was placed in a suitcase surrounded by barbed wire and walls to express the suffering of the city and its people under Israeli military occupation. Palestinians seek to confirm, by this tree, that they are turning Israeli tools of killing into tools of life, to assure that they want peace, justice and freedom. Khader Handal, ICT Officer at HCEF, said that the idea originated with Bethlehem Museum, and that they began working on it together, to send a message to all peoples, all over the world, that the olive tree is still a symbol of peace. The symbolic tree, which is regularly uprooted by Israeli settlers and soldiers, is therefore decorated to hold many meanings for the Palestinian people. 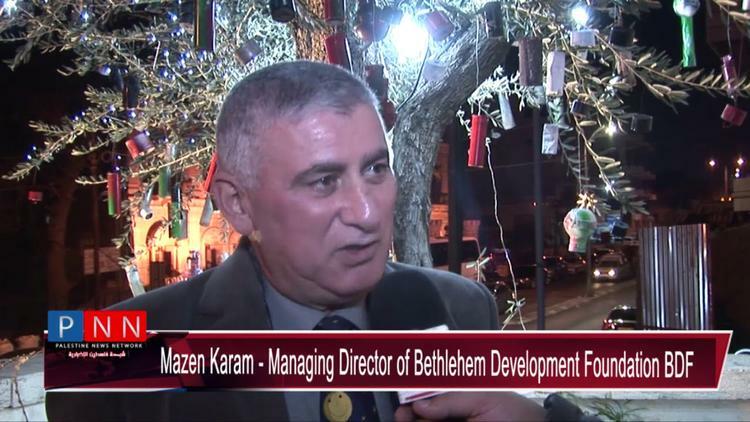 The citizens of Bethlehem and other communities who attended the lighting of the museum tree expressed their happiness with the idea, as it delivers the Palestinian reality in synchronicity with the glorious Christmas holidays which carry on the human message that Jesus Christ symbolizes. At the end of every year, when the world celebrates Christmas, Palestinians wish to remind the world that they have been under occupation for 70 years, with the hope that someone will help them to end it, and live in dignity and freedom.